From biofuels to a collapsible wind turbine, dozens of senior design projects will be on display Friday, Dec. 7, from noon to 3 p.m. in Nitschke Hall at The University of Toledo. The CodeWeGo team is, from left, Rita Ablordeppey, Zach Podbielniak, Carla Marzari and Jake Perkins. A design team made up of students in the UT Department of Engineering Technology has created a multi-lingual web platform that is already in the startup phase due to assistance from UT’s LaunchPad Incubation Program. 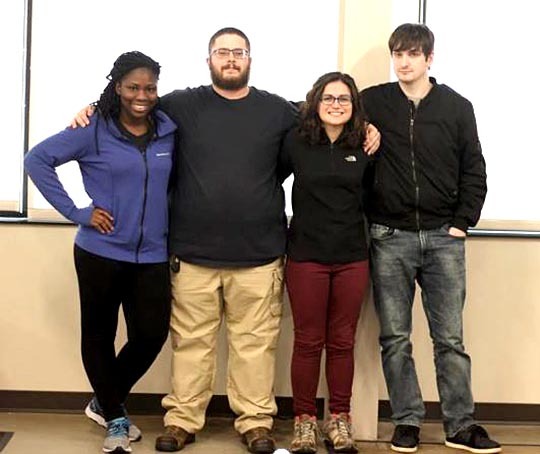 CodeWeGo is a senior capstone project for Carla Marzari, Jacob Perkins, Zachary Podbielniak and Rita Ablordeppey. “The team has developed a scalable web application to assist non-English-speaking users to learn how to code using their native languages, including Spanish and Chinese. The project uses front-end framework React and Golang/Node programming languages,” Dr. Weiqing Sun, associate professor in the Department of Engineering Technology, said. The free, public exposition showcases projects created by more than 250 graduating seniors from the departments of Bioengineering; Civil and Environmental Engineering; Electrical Engineering and Computer Science; Engineering Technology; and Mechanical, Industrial and Manufacturing Engineering. As part of these projects, students form business-consulting units develop a solution for a client’s technical or business challenge. Businesses, industries and federal agencies sponsor the projects required for graduating seniors in the UT College of Engineering. The expo also will showcase 12 freshman design projects and feature the High School Design Competition for area high school students from 10 a.m. to 2 p.m. This entry was posted on Friday, December 7th, 2018 at 3:56 am and is filed under Engineering, Events, News, Research, UToday .